>> check here all the past interviews and follow us on facebook too! Hoje estou à conversa com uma criadora portuguesa que vive na Holanda: a Joana Pedroso. A responsável pela marca Trincar Uvas cria belos acessórios que gostam de brincar com a linha de algodão, a cor e a geometria - e o resultado é delicioso! >> E como se não bastasse brindar-nos com a beleza das suas criações, a Joana ainda decidiu oferecer uma delas ao meu leitor mais sortudo - leiam a entrevista até ao fim para saber como participar neste fantástico giveaway! 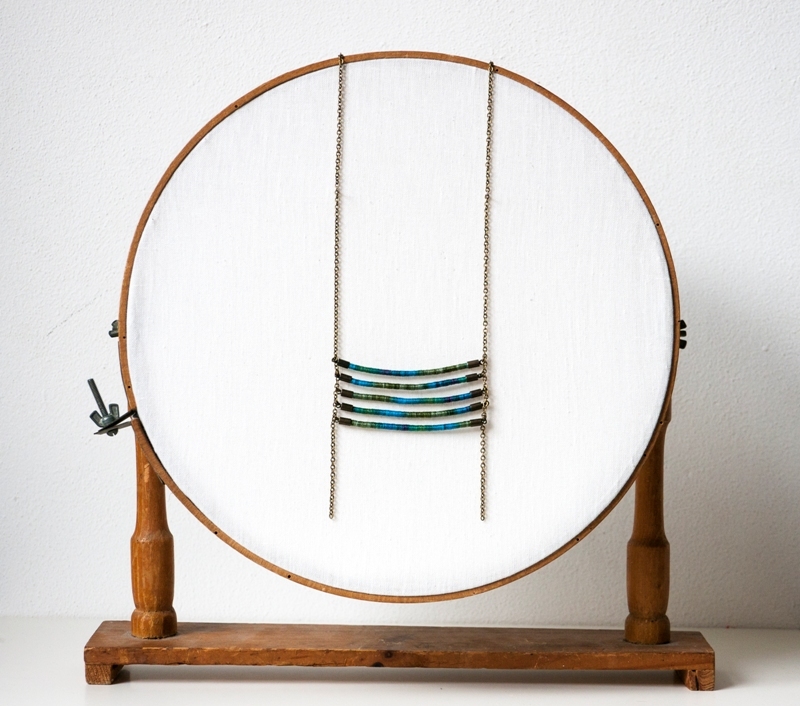 Today I'm chatting with a Portuguese crafter living in The Netherlands: Joana Pedroso. 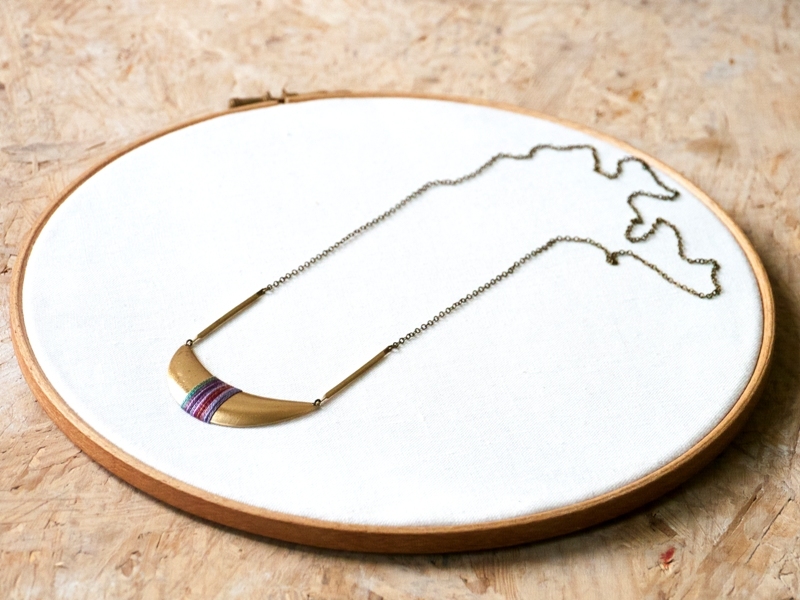 The creative mind behind Trincar Uvas creates beautiful accessories that love to play with cotton thread, color and geometry - and the result is delicious! >> And as if wasn't enough showing us the beauty of her creations, Joana also decided to offer one of them to the luckiest of my readers - read the interview until the end to find out how to participate in this fantastic giveaway! 1. who is Joana Pedroso? I grew up in a little village in the coast of Portugal and 5 years ago I moved to the Netherlands where I've fallen in love. Somedays I work as a paper restorer and in others days I give room to my creativity. I am the happiest amongst nature, friends and art. 2. have you become what you wanted to be when you grew up? Since I was a kid I've been always changing my mind on what I wanted to ''be''. I remember spending hours going through a list of degrees deciding what I wanted to study. I found out about a course that was called Conservation and Restoration and it sounded great - lots of manual work and it was connected to Art and History. But now, after spending 5 years studying it and 5 more years working, I've come to realize what I really want to ''be'' is an independent creative crafter/artist. I used to cringe at the idea of owning my own business - I only thought of the headaches and responsibilities, but now I can only smile at the idea of spending all of my time on my own work. There is this little bug inside of me that whispers new ideas from time to time. There is also this other bug that makes me want to do things with my hands. I don't know where they come from but I just do what they say! 4. your artistic media of choice. I definitely have a strong connection with textiles - I love their texture, diversity and versatility and the warmth they give to any project. 5. the favorite corner of your workspace. My workspace is a corner and i love all of it! 6. a day at work. I don't really a have a routine. If I am feeling creative I'll spend a whole day (sometimes a week) making new pieces. On the days I am feeling patient I photograph new items, post them on Etsy, etc. Other days I might spend the whole day procrastinating behind my computer... it really depends on my mood! 8. an advice to your younger you. It's the one I still give to myself everyday: Don't worry! 9. a plan to the future. Moving to the south and having a big garden. 10. a personality that influences you. Anybody that stays true to himself. 11. a book you think everyone should read. L' Ecume des Jours from Boris Vian. 13. a city to fall in love with. 14. a favorite food and drink. Grilled Sea Bream and fresh passion fruit juice - yummie!! 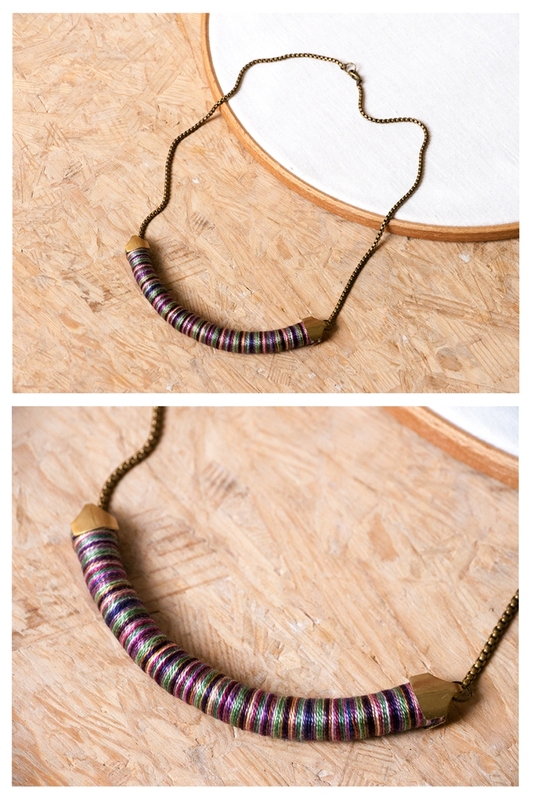 Joana is offering to one of my readers this beautiful tribal inspired necklace, evaluated in $30. So... what do you have to do? + just leave a comment bellow! + ... and you can have a second extra chance to win by becoming a facebook fan of Trincar Uvas. Please, don't forget to let me know if you're a fan in your comment bellow so it can count for the giveaway, otherwise I will miss it. The lucky winner will be announced on wednesday, May 1st, and contacted by email, so don't forget to also leave your name and contact. Good luck! We had 41 comments and 90 entries in this giveaway. random.org decided that the lucky winner is the number 5... congratulations nanouke! I'll be contacting you soon, I'm sure you'll love your prize! Thank you so much to all participants and new followers - not only for participating, but also for your kind words about the interview series and Joana's work! Great interview, I love Joana's work! 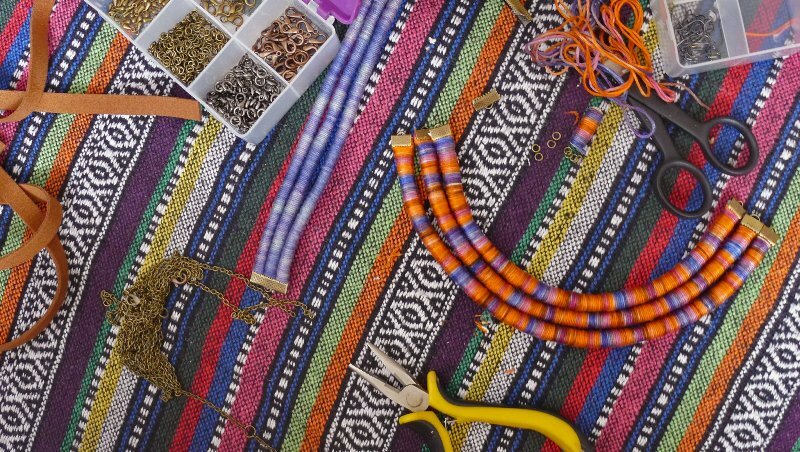 It reminds me of the days I used to play with thread, making bracelets for myself, I guess that must have been the begining of my crafty bug ;) I love the necklace she's giving away so, wish me luck! P.S: I'm already a fan of both Facebook pages. Eu quero, eu quero! :) É lindo! I love love love her work! So colorful and bright, and the photos are just dreamy! Parabéns pelo trabalho desenvolvido nesta serie, trazes-nos sempre bons criadores e é um prazer ler estas entrevistas semana após semana. 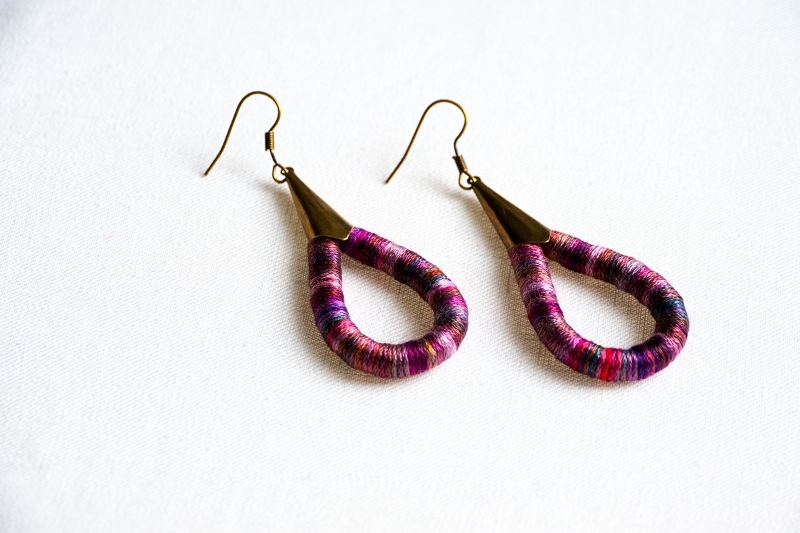 Hi, my name is Elisabete and I'm a big fan of handmade jewellery. 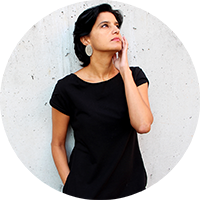 I'm a follower of Ana Pina facebook page and I've discovered that we have similar stories: both architects in love with jewellery. I'm already a fan of Ana and it seems I'll become a fan of Joana Pedroso too, because I fell in love with this necklace!!! And I want it :D !!! Parabéns pela página, não conhecia o trabalho da Joana Pedroso e adorei, fiquei fã! gostava muito de ganhar o colar, claro! Great work!Thanks for the giveaway! 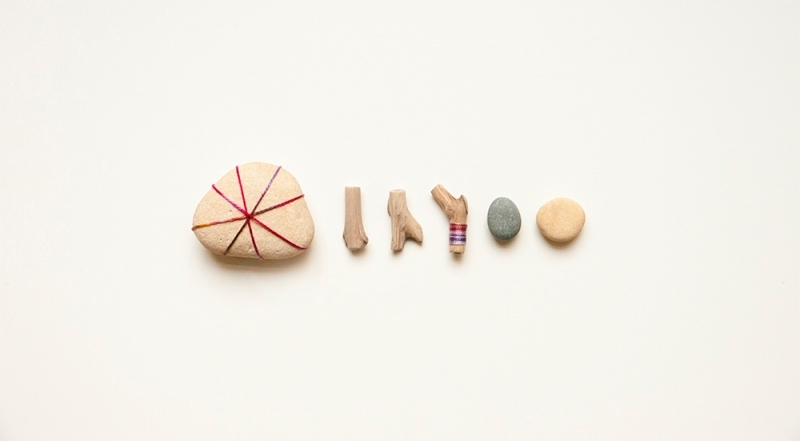 wonderful interview, love the colors in Joana's work! Não é para mim :) mas eu conheço uma menina que vai dar saltos de alegria se eu lhe oferecer uma destas peças maravilhosas! Adoro o trabalho da Joana! As cores, a delicadeza e qualidade das peças dela mostram tal como a entrevista mesmo isso, paixão e criatividade no que faz! Um grande beijinho e muito sucesso! Ahhhh e dá cá esse colar lindo ;). A Joana é fantástica e adoro o trabalho dela. Já tens o meu email Ana. 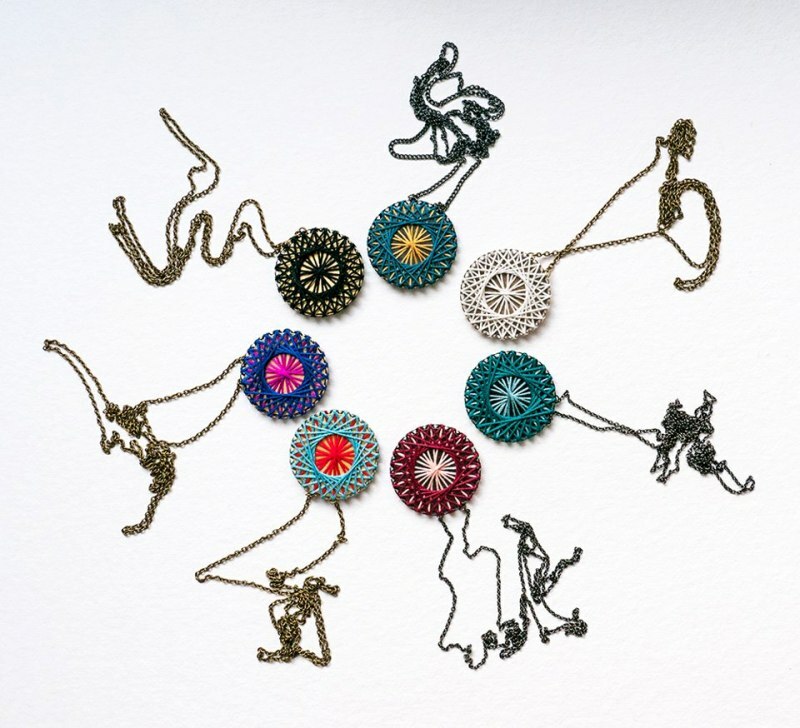 absolutely love Joana's work and absolutely love your beads collection! Congrats on your interviews! Your jewelry is gorgeous!! Hope I win. Não conhecia o trabalho da Joana e adorei! Tão simples e tão bonito! Adorava que o meu pescoço pudesse ostentar feliz o colar da Joana. carla gama, carlagama@ua.pt, just made myself fan of both FB pages! Wonderful work - great interview - thank you for sharing! I love her work! I have been having an eye for her work from some time now, excelent interview! Já sou fã das duas páginas! adorei conhecer o trabalho da Joana Pedroso e adorava ser a vencedora deste colar. Estou encantada com o trabalho da Joana, que peças lindas! Claro que eu quero participar desse sorteio (e já sou fã das duas páginas)! uau! Que peças lindas! Adorei e adoraria ser a sortuda a ganhar o sorteio. De qualquer forma, já me sinto feliz por ficar a conhecer o trabalho da Joana Pedroso. Peças muito originais e cheias de cor! I keep my fingers crossed!! Sou fã das duas páginas! Aaaahhhhh, ainda vou a tempo? Adoro, adoro as peças da Joana! Tb já sou fan dos dois projectos no Facebook! Olha eu cá estou, não apenas porque li a palavra giveaway, mas porque vi de quem estavas a falar hoje! também já tive a joana no blog e quando descobri o trabalho dela, fiquei apaixonada! achei uma verdadeira delícia a forma como ela trabalha as cores e os tecidos! portanto aqui fica o meu contributo para o giveaway, mas para a entrevista em si! um beijinho grande às duas! Sou fã das duas páginas. também vou tentar a minha sorte! :) simplicidade e delicadeza, parabéns pelo trabalho! Já sigo as duas páginas no facebook. Truly works of an artist. Thank you for this opportunity to win one of her necklaces!